In this post I demonstrate how easy it is to learn jazz guitar improvisation. The main reason a lot of people struggle with improvisation on guitar is not that they lack the ability to do it, but that they haven’t really nutted out their method for learning it and process for practicing it. There is nothing mystical about the ability to improvise – it is a musical skill that anyone serious about music can learn, and should learn, due to the new possibilities that it can open up for you on your instrument. It’s great fun to do! Rather than get too technical into the nuts and bolts of the theoretical concepts about what to do harmonically over the chord changes and so on, this lesson takes a simple minor pentatonic pattern and improvise with using some standard jazz chord changes. Handy PDF Download: Get access to a print friendly pdf version of the exercises in this article as well as a backing track to use for your practice session. Learning to improvise has similarities with learning a spoken language. It is a process of learning vocabulary – however in a musical context the ‘words’ are actually musical phrases, patterns and ideas. That’s right, you need to actually learn the phrase, patterns and ideas. Improvisation is usually not an act of complete spontaneity, of ‘making stuff up on the spot’. Imagine doing that in a spoken language context – people would think you were having some kind of esoteric spiritual experience at best, or at least will not be able to understand you at all. This is why to me I think of improvisation more like ‘speaking’ then creating. Obviously there is creativity at play however it is primarily a musical way of communicating with your listener and interacting with other musicians. My 2 year old son is in the process of learning words. Every day he surprises my wife and I with a new one. However when he becomes an adult he’ll be able to spontaneously put the words together for the purpose of conversing. The process of learning an improvised music form is very similar to this. Implement the vocabulary, and just stick to one idea or lick at a time in your practice session. Then, start to combine the patterns/ideas/licks you have learned. At this point, your solos will naturally begin to sound much more original. The lesson video features the following 7 steps to creatively using the minor pentatonic pattern in a jazz guitar improvisation context. Fast forward the video to the time code (in green) to get to the spot in the lesson that demonstrates each step below. Step 1 involves memorising the above minor pentatonic pattern, and then just messing around a bit with as you play the scale up and down a little bit over the backing track. You don’t need to play the full scale, just take a few notes here and there and improvise with them using different rhythms and patterns. A lot of horn players include fourths intervals in their melodic solos, and this is a very convenient interval to play on guitar as the tuning of most of the guitar strings is in fourths. This means to get that jazzy horn sound on guitar you simply need to move one string across as you stay on the same fret. An easy way to play this pattern is to think ‘Left-Up-Right-Up’: as you play the scale cross ‘up’ to a higher string on the left side of the hand, and then ‘up’ for the right side of the hand. Play the backing track again and use only this idea as you improvise until you feel it really under your fingers. This pattern is an interesting twist on the previous fourths idea in step 2. This time, follow each of the scale notes with a note a fourth below as you ascend the scale. In this case you play ‘down’ a string on the left side of your hand, and then ‘down’ a string with the right side. Once again, play along with the backing track but just use this ‘Left-Down-Right-Down’ pattern before you move to the next step. Yet another variation on fourths patterns on the scale. Now think as if going ‘up’ 2 notes on the left side of the hand, and then ‘down’ 2 strings on the right side of the hand, hence the name of this ‘Left-Up-Right-Down’ pattern. Once you have mastered this idea over the backing track, combine all the ideas covered from Step 1 to 4. You should find that your solo is sounding a bit ‘richer’ at this point with more variety. Half-step approach notes are notes one fret below a scale note, and are one of the iconic ideas used in jazz. Before you hit each note of the scale simply play a note one fret below each scale note. Approach notes are key trick to helping your solos sound more jazzy. If you solo only with approach notes your solo may sound a little bit strange, but it is still important to initially limit yourself to just using this one idea as you practice over the backing track. Once you incorporate the other ideas you can use them more sparingly and it will give a great sound to your solos. Just as with the previous ideas, practice soloing exclusively using half-step approach notes for a while over the backing track and then start to combine a solo using the ideas in the previous steps. The final idea used in this jazz guitar improvisation post is half-step enclosures, a melodic idea used frequently by the great jazz guitarist Joe Pass. Enclosures are notes that surround a scale note. If you play one fret above a scale note, then one fret below, and finally playing the scale note, you have a half-step enclosure. The above exercise places enclosures on each step of the scale. I find that half-step enclosures are quite a ‘spicy’ solo ingredient, so in a real solo you would only use these occasionally. However, just as with the previous steps, experiment on the backing track exclusively using enclosures without other ideas initially. Doing so will train your ear to their sound so you have more intuition when to include them in your soloing. So you have all your ingredients now, now it’s time to combine them into a tasty solo! Deliberately try to incorporate all the above ideas as you practice with the backing track. Pick perhaps just 2 of the ideas at a time, and then finally combine them all as you improvise. The magic starts to happen once you have really internalised the vocabulary, and aren’t so much consciously thinking about using a piece of vocabulary in a solo. Just like when you get fluent in a spoken language, you don’t need to think of every single word that you say, you are just spontaneously communicating with someone. This feeling in your solos will come with time as you become more acquainted with the jazz vocabulary. I would like to give a shout out to Matt Warnock at mattwarnockguitar.com who I credit for the ideas I go through on the video. 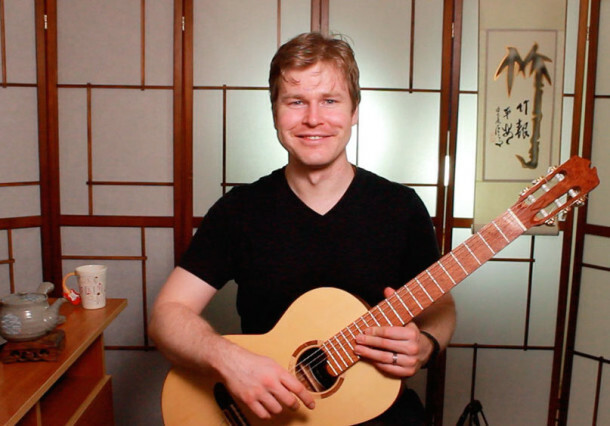 He’s a great teacher and has a ton of resources about jazz guitar improvisation on his site. I hope that this beginner’s guide on jazz guitar improvisation has helped you learn this crucial musical skill that is overlooked by many guitarists. Having started out as a classical player and now dabbling in other styles like jazz, my eyes have really opened to the amazing possibilities that improvisation can bring. Improvisation is a great way to express yourself in your music and is a great way to develop aural skills too. I am excited to share more of my explorations in jazz guitar playing in the future on this blog. Thanks very much for reading and I hope you had some good takeaways out of this lesson. I would really appreciate your feedback, so do let me know what you think about this post by leaving a comment below. If you enjoyed this post and would like to be notified when my next posts are coming out, make sure to subscribe to the blog by entering your details below if you haven’t already. I wish you the best in your improvisation journey! This is exactly what I needed as I am in the area of learning this scale. My teacher taught it to me yesterday, now I have things to practice with as I move forward. Thank-you for the easy to understand method of putting your lessons together. That’s great Chuck – When I was shown this approach I was really drawn to it as it is a very natural way of learning jazz vocabulary. It’s also a very good way to memorise scale shapes like this. Thanks for this, Greg. This is most helpful. Ir’s simple to understand and is practical, and it didn’t load me with fancy jazz terminology. Many other teachers impress with convoluted theory and terms I don’t understand to get their point across, but this is great. A great lesson! As good a way to get started as I’ve heard. Your blood’s worth bottling, as they say in your neck of the bush. Hi, nice recommendations for the beginning. I read many such instruction in e-books and printed one but I miss some good ideas to change for the 4th or 5th used in many songs. Mostly the pentatonic, scales and arpeggios goeas up and down. When a simple songe changes e.g. for Am to Dm and the to E7 and back I would like to get some hints. I try myself to stay in one fret porsition and change only the one or other tone, but I am sure there are other and better ideas. Nice greetings from Vienna! Thanks George! In future posts we’ll get into more complex scales and ways to play over changes – stay tuned! Thanks from Ohio, USA, for the lesson Greg. The simplicity of the approach belies the complexity of the material. Well taught. Thanks Larry! I’ve found that many of my students have gotten a lot out of approaching improvisation in this way, it’s a great way to get started in the style. I like your approach and the way you communicate it. So much of what’s online is really only marginally useful, but I found this lesson well thought out, and the emphasis on limiting practice sessions to just an idea or two is right on. This is a scale I’ve know for a very long time, but have used only for blues. Employing it in a jazz context is extremely useful. Thanks for a really fine lesson. Really enjoyed the lesson, it’s a great introduction to Improvising, made me look at the whole concept from a different perspective, thank you very much. My pleasure Gintautas, great to help this have given you a good start with jazz improv. Cheers! Thank you so much for this strait forward approach I bin taking lesson for years and you taught me more in a 10 minute lesson than I learned in 6 months. Thank you.